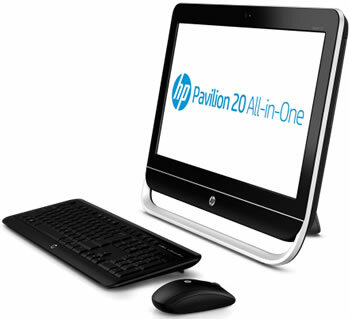 Preparing for next month's launch of Windows 8, HP has unveiled four new all-in-one PCs, including two touch-enabled models. Starting with the least expensive, HP's Pavilion 20 will cost only $499 and, as one would expect for that price, the system has a fairly basic feature set. So basic, in fact, that HP only mentions a 20-inch display, an HD webcam, the choice between an Intel or AMD processor and up to 2TB of storage, while pictures reveal an optical drive, standard connectivity options as well as a wireless keyboard and mouse. Moving forward, the new $799 Envy 20 TouchSmart and $999 Envy 23 TouchSmart boast 1080p displays with support for 10-finger multitouch. In addition to touchscreens, HP occupied the extra budget with a selection of Intel's Ivy Bridge chips (the Pavilion 20 is suspected to use Sandy Bridge), a 3TB HDD, flash storage options including a cache drive and a dedicated SSD, an HD webcam, as well as HP's Beats Audio engine, Connected Backup solution and other in-house offerings. Both the Pavilion and the Envy will ship in October. On the premium front, HP has revealed its first Spectre-branded all-in-one, which borrows heavily from the aesthetics of Apple's iMac series. Said to be the thinnest AIO in HP's arsenal at 11.5mm thick, the Spectre One offers a 23.6-inch 1080p display that's covered by edge-to-edge glass, Intel's Ivy Bridge CPUs, an unnamed Nvidia graphics chip with 1GB of VRAM, an optional SSD, TouchZone NFC technology, and an array of connectivity including two USB 3.0 ports, an HDMI input, a headphone jack backed by Beats Audio. Although the Spectre One doesn't have a touchscreen, it'll ship with a wireless trackpad (not unlike Apple's Magic Trackpad) which will fill the void by allowing users to navigate Windows 8's touch-oriented interface with swipes and taps. Along with the standard array of HP applications and services, the Spectre One will come with a two-year subscription to Norton Internet Security and full versions of Adobe Photoshop Elements 10 and Premiere Elements 10. Pricing will start at $1,299 and units should begin shipping in November.